Sir Ronald Ross KCB KCMG FRS FRCS (13 May 1857 – 16 September 1932), was a British medical doctor who received the Nobel Prize for Physiology or Medicine in 1902 for his work on the transmission of malaria, becoming the first British Nobel laureate, and the first born outside of Europe. His discovery of the malarial parasite in the gastrointestinal tract of a mosquito proved that malaria was transmitted by mosquitoes, and laid the foundation for the method of combating the disease. He was quite a polymath, writing a number of poems, published several novels, and composed songs. He was also an amateur artist and natural mathematician. He worked in the Indian Medical Service for 25 years. It was during his service that he made the groundbreaking medical discovery. After resigning from his service in India, he joined the faculty of Liverpool School of Tropical Medicine, and continued as Professor and Chair of Tropical Medicine of the institute for 10 years. 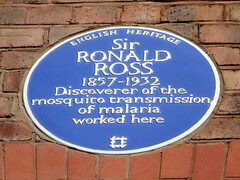 In 1926 he became Director-in-Chief of the Ross Institute and Hospital for Tropical Diseases, which was established in honour of his works. He remained there until his death.